​"What she's doing is something completely new." 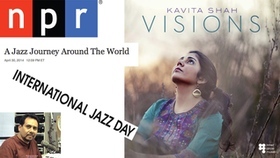 - NPR, "All Things Considered"
Vocalist and composer Kavita Shah makes work in deep engagement with the jazz tradition, while also addressing and advancing its global sensibilities. A lifelong New Yorker of Indian origin hailed for possessing an "amazing dexterity for musical languages" (NPR), Shah incorporates her ethnographic research on Brazilian, West African, and Indian musical traditions into her original repertoire. She was named Downbeat's Best Graduate Jazz Vocalist in 2012 and won the ASCAP Herb Alpert Young Jazz Composers Award in 2013; her highly-acclaimed 2014 debut album-the internationally-minded project VISIONS (Inner Circle Music/Naïve Records)-was co-produced by guitarist Lionel Loueke. 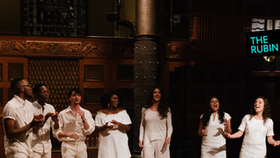 In 2017, her interdisciplinary work "Folk Songs of Naboréa," a contemporary song-cycle for seven voices, was premiered at the Park Avenue Armory and named by Nate Chinen (NPR) as one of the Top 10 Jazz Performances of the year. Shah's second album Interplay, a program of standards and originals in duet with bassist François Moutin – with special appearances by pianist Martial Solal and NEA Jazz Master Sheila Jordan, Shah's mentor – is due for release in February 2018 on Dot Time Records. Raised in Manhattan, Shah traces her commitment to jazz to the childhood influence of uptown saxophonist Patience Higgins, a former neighbor whose band she would later join at hallowed Harlem spots like Minton's and the Lenox Lounge. Trained first as a classical pianist, Shah spent her formative years in the prestigious Young People's Chorus of New York City, absorbing and performing in a vast range of musical idioms. An early and enduring fascination with Spanish literature and Afro-Cuban music helped guide her to major in Latin American Studies at Harvard, where her B.A. honors research on contemporary Afro-Brazilian music and politics, drawing on fieldwork in Salvador da Bahia, won the Kenneth D. Maxwell Prize in Brazilian Studies and the Cultural Agents Thesis Prize. She was also awarded the David McCord Prize for artistic talent. After a brief stint working for The Nation magazine and Human Rights Watch, Shah went on to earn a Master of Music degree in Jazz Voice at Manhattan School of Music, where she studied with Theo Bleckmann, Peter Eldridge, Steve Wilson and Jim McNeely. She continues to study voice with Jeanie LoVetri and composition with Nils Vigeland. Shah has sung her music at major concert halls, festivals, and clubs on six continents, including such venues as the Kennedy Center, Winter Jazz Fest, BRIC Jazz Fest, Rochester Jazz Festival, San Jose Jazz Festival, Melbourne Jazz Festival, Brisbane Jazz Festival, Perth Jazz Festival, Safaricom Jazz Lounge in Nairobi, Kenya, Art Basel: Miami, Park Avenue Armory, Blue Note, Jazz Standard, Joe's Pub, Iridium, Duc des Lombards, India's National Centre for the Performing Arts, Blue Whale, Vermont Jazz Center, Philadelphia Museum of Art, Rubin Museum, and National Jazz Museum in Harlem. She has worked with such artists as Lionel Loueke, Sheila Jordan, Martial Solal, François Moutin, Greg Osby, Steve Wilson, as well as tabla guru Samir Chatterjee (India), mridangam player Rajna Swaminathan (US/India), percussionist Rogério Boccato (Brazil), electric bassist Alune Wade (Senegal), acoustic guitarist Bau (Cape Verde), Ethio-jazz founder Mulatu Astatke (Ethiopia), and kora master Yacouba Sissoko (Mali). 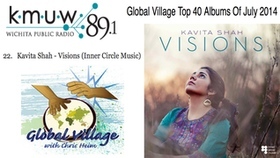 A vivid self-portrait in mosaic form, Kavita Shah's Visions'on Greg Osby's Inner Circle Music heralds the arrival of a strikingly original, globally minded new voice. The gifted vocalist/composer brings together a rich variety of musical, cultural, and personal influences into a formidable debut album that combines a jazz quintet with Indian tablas and the West African kora. Nyugen Smith (visual artist) Kavita Shah is a vocalist, composer, and lifelong New Yorker who makes work in deep engagement with the jazz idiom while addressing and advancing its global sensibilities. 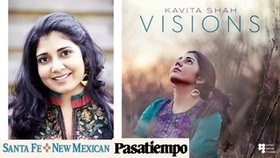 Hailed by NPR for possessing an "amazing dexterity for musical languages," Kavita incorporates ethnographic work on Latin American, West African, and South Asian traditions into her music. Her 2014 debut album "Visions," co-produced by Lionel Loueke, was released to great critical acclaim. 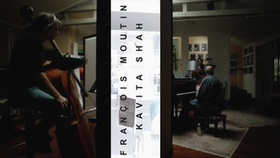 In 2018, Kavita released "Interplay," an album of standards and originals in duet with bass virtuoso François Moutin, which was nominated for a Victoire de la Musique (French Grammy Award) for Jazz Album of the Year. 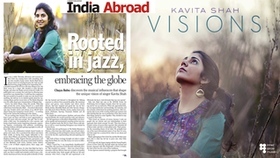 Kavita regularly performs her music at major concert halls, festivals, and clubs on six continents. She holds an A.B. in Latin American Studies from Harvard and an M.M. in Jazz Voice from Manhattan School of Music. 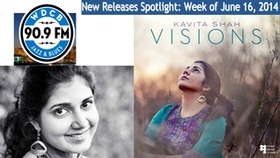 You might hear the arrangement of an Indian raga on singer Kavita Shah's sparkling debut, Visions, or the prominent tabla on her version of the Stevie Wonder title track, and jump to conclusions about an immigrants' daughter on a roots trip. That wouldn't be quite right. Shah's Indian parents had little music at home save for a few LPs; her first instrument was the classical piano, and she only dabbled in Indian music training while already a jazz student at the Manhattan School of Music. You might, instead, hear the opening track, the Cape Verdean "Sodade," marvel at Shah's flawless accent, and wonder if you'd stumbled on one of Cesaria Evora's nieces. Her fluent Portuguese on Antonio Carlos Jobim's "Triste" only compounds the effect. 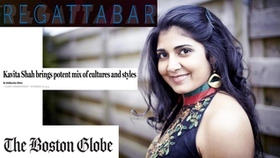 Ms. Shah performs with her group at Boston's Reggatabar tonight at 8pm. READ THE FULL Boston Globe INTERVIEW. On this edition of WICN: Worcester - Jazz Matinee Host Chet Williamson will be joined by singer Kavita Shah. 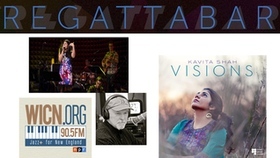 Kavita Shah who is playing Boston's Regattabar this Tuesday November 18 is gaining a reputation as a visionary young singer, composer, and arranger. Hailed by Downbeat Magazine as the "Best Graduate Jazz Vocalist" (2012) and winner of the ASCAP Herb Alpert Young Jazz Composers Award (2013), Ms. Shah--a native New Yorker of Indian origin fluent in Spanish, Portuguese, and French--incorporates diverse musical elements into her jazz-based repertoire. Her debut album: Visions (co-produced by guitar virtuoso Lionel Loueke) combines the sounds of the traditional Indian tablas and West African kora with those of a jazz quintet. 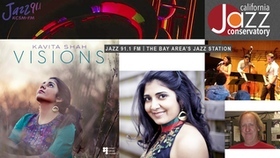 Kavita Shah's performance at the California Jazz Conservatory (formerly the Jazzschool Institute) in Berkeley aired September 18, 2014 on San Mateo, CA's KCSM: In the Moment, a Jazz performance series hosted by Jim Bennett. 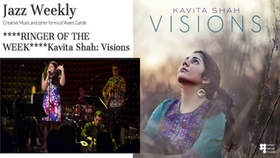 Shah's concert was part of a west coast tour supporting her debut album Visions, and featured Pat Carroll, Steve Newcomb, Noah Garabedian, Guilhem Flouzat, and special guest Rohan Krishnamurthy. Bringing together a rich variety of cultural, musical, and personal influences, Shah has a developed a strikingly original, globally minded new voice. 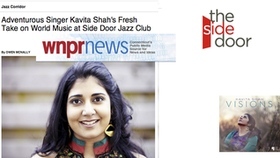 Kavita Shah is at Jazz Standard tonight. 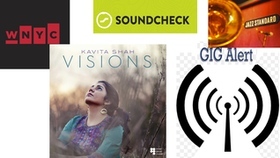 WNYC - New York / Soundcheck: Gig Alert A first generation Indian-American singer, Ms. Shah reaches back into her cultural heritage to add ornament to her striking jazz interpretations. 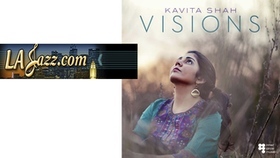 Listen to Kavita's version of Stevie Wonder's "Visions." 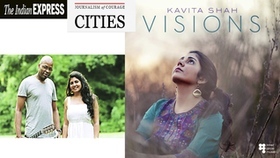 Singer Kavita Shah's journey to the recording of her debut album, "Visions," was a long one, involving hours spent honing her skills - on stages and in classrooms - punctuated by bursts of inspiration and self-discovery. If you want to talk degrees and accolades, Shah's pedigree is impressive: the undergraduate diploma from Harvard (she majored in Latin American Studies). The master's degree from the Manhattan School of Music. Composition and arranging studies with Phil Markowitz and Jim McNeely. Performances on some of the most prestigious venues in the country, and so on. 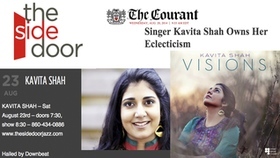 READ THE FULL Hartfor Courant ARTICLE Kavita Shah performs on Saturday, Aug. 23, at the Side Door Jazz Club in Old Lyme. Showtime is 8:30 p.m. Tickets are $28.50. Information: thesidedoorjazz.com. 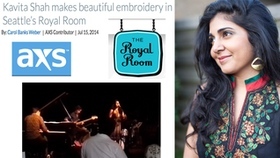 Kavita Shah creates music without boundaries. A native New Yorker of Indian heritage, Shah developed broad musical tastes as a child, studying classical piano, listening to her parents' pop albums, singing in multiple languages with the acclaimed Young Peoples Chorus and soaking up hip hop on the radio. 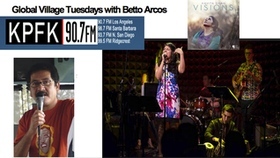 Eventually, jazz became Kavita's focus, but her music continues to incorporate influences and instruments from other cultures, including Brazilian, Afro-Cuban, and Indian folk and classical traditions. WWUH listeners can get a taste of Kavita Shah's music during an interview with the composer/arranger on Out Here & Beyond, Tuesday, August 19, 2014 at 10:00 a.m. Host Chuck Obuchowski will speak with Shah and will spin several of her eclectic musical offerings during the program. A vivid self-portrait in mosaic form, Kavita Shah's Visions heralds the arrival of a strikingly original, globally minded new voice. The gifted vocalist/composer brings together a rich variety of musical, cultural, and personal influences into a formidable debut album that combines a jazz quintet with Indian tablas and the West African kora. 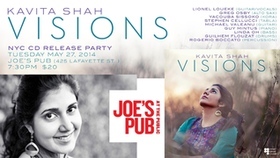 Ms. Shah's new album, Visions, is included on Wichita's KMUW: Global Village Top 40 Albums Of July 2014. Kindred spirits and fellow sonic globetrotters-singer Kavita Shah, the native New Yorker of Indian descent, and Benin-born guitarist and co-producer Lionel Loueke-join forces in this breathtakingly beautiful collaboration that brings a wealth of musical influences to bear. With Loueke's distinctive percussive guitar work weaving in and out of the mix, Shah soars with understated majesty while alternately singing in Portuguese, Spanish, and English. READ THE FULL Downbeat Magazine REVIEW. It was hotter than hell, but inside Seattle's Royal Room last Tuesday night, New York vocalist Kavita Shah brought her own special kind of shade. Brilliant with evocative, dream-drenched vision, bursting with vibrancy, Shah and her young, traveling band - Brisbane, Australian pianist Steve Newcomb, Perth bassist Des White, Parisian drummer Guilhem Flouzat - painted the small nightclub/bar with beautiful embroidery. Whether the young jazz vocalist chose a Joni Mitchell cover from her debut Visions album, a lilting Brazilian number, or went with whatever happened to meet her fancy, she made every song her very own. READ THE FULL AXS REVIEW. On WRTI - Philadelphia 'The Bridge' J. Michael Harrison presents his award-winning blend of jazz that takes you from the mainstream to the edge of the art. Rarely heard artists are played with regularity, as is a dash of jazz poetry. 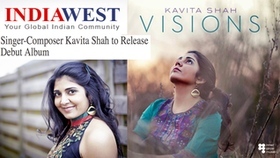 Mr. Harrison recently sat down with singer/composer Kavita Shah around her latest CD release - Visions. Released on Greg Osby's Inner Circle Music, Visions is a vivid self-portrait in mosaic form and heralds the arrival of a strikingly original, globally minded new voice. The gifted Shah brings together a rich variety of musical, cultural, and personal influences into a formidable debut album that combines a jazz quintet with Indian tablas and the West African kora. Listen to the attached interview. 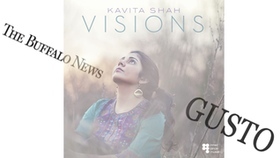 Kavita Shah's new album, Visions, is exactly as she intended: jazz as viewed through an enchanted prism. All 15 compositions, including a bonus track, force the listener to open up another channel of perception. It's all jazz, but played with global enlightenment, transforming jazz into a revelatory, blossoming dream just on the other side of the world. Released on Inner Circle Music May 27, 2014, Shah's new album contains a lavish collection of tough covers and splendid originals. The difference is in this New York City-based vocalist's singularly individual and personalized approach to the material by such formidable artists as Joni Mitchell ("Little Green") and Stevie Wonder ("Visions"). Her ace in the hole is where she comes from and the world she embraces. Not content to play her standards straight, Shah - whose paternal grandfather traveled from his native Mumbai to New York in the 1940s - comes by the globally expansive, multi-styles naturally. Her parents emigrated to New York, raising her to love all kinds of music. "I didn't grow up in a traditional household," Shah said. "My parents wanted to expose me to music, an opportunity they didn't have growing up, but not just to Hindi film songs or Indian classical music. They immigrated to New York in the 1970s, so there was a lot of pop in the house: The Beatles, Michael Jackson, Frank Sinatra." READ THE FULL AXS REVIEW. Diversity is the watchword of today's young artists, whether they're piano players from Cuba or singers from New York City. 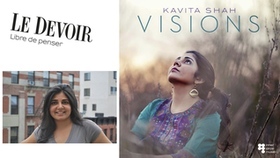 Kavita Shah is the latter, a third generation New Yorker of Indian descent who speaks four languages, has sung in many more, has studied ethnomusicology at Harvard and who considers NYC hip hop radio station HOT97 among her many influences. All those many elements of her musical personality come together on this set, produced by guitarist Lionel Loueke and released on Greg Osby's Inner Circle Music. The title cut is her vision of Stevie Wonder's Visions portrayed as a tabla driven funk. The repeating chime and piano figure on Joni Mitchell's Little Green effectively distills the song's pastoral essence; the tabla interlude that follows sets the table for Shah's interpretation of rapper M.I.A. 's Paper Planes, also stripped of its adornments and distilled to its very core. Jobim's Triste, one of three Latin pieces here, is also quite beautiful, a nice pairing of Shah's light voice and the flute contribution of Steve Wilson. Don't be fooled by the abundnt use of the tabla or Shah's willingness to explore the music of her ancestry. This is not an Indian music record; it's a jazz record though and through. If you enjoy the stew that can be created when jazz comes in contact with music from diverse cultures, place Visions in the player. 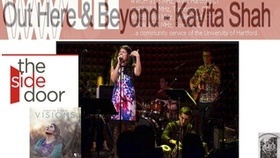 Vocalist Kavita Shah, a native of Manhattan, approaches her debut recording as a leader with no trepidation. Opening with Cape Verdean composer/performer Amandio Cabral's "Sodade", one must be prepared to be surprised. The blend of co-producer Lionel Loueke's acoustic guitar, the koto of Yacouba Sissoko, acoustic bass of Linda Oh, the tabla of Stephen Cellucci and hand percussion of Rogerio Boccato, the song floats in on Ms. Shah's rich voice (overdubbed later to create a sweet chorus). When the string quartet enters, it's the perfect touch. The title track, the Stevie Wonder song with such hopeful lyrics, has a strong drum track (Guilhem Flouzat) and percussive guitar (Michael Valeanu) plus atmospheric piano (Steve Newcomb - Ms. Shah is the vocalist in his Orchestra). The overdubbed vocals create an orchestra of its own. The 3rd track, Joni Mitchell's "Little Green" (from 1971's "Blue") builds on the original with Ms. Shah's showing the influence of the composer's elastic voice but using the koto, piano, percussion bass, and Flouzat's sensitive brushwork creates a dream-like background. READ THE FULL Step Tempest REVIEW. 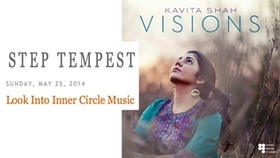 Kavita Shah: Visions, Inner Circle Music. 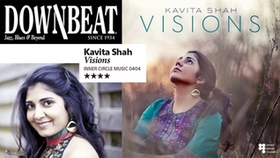 Harvard/Manhattan Music educated, Downbeat award-winning vocalist 2012, Kavita Shah makes a grand debut with a set of Indian tabla vocals, Brazilian + Malian influences. Produced by & co-starring guitarist Lionel Loueke; with Linda Oh on bass, Steve Wilson on reeds, and Rogerio Boccato on percussion. Inventive arrangements make it work. 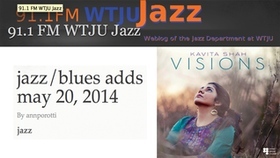 Listen for Kavita Shah's new album, Visions, on WTJU 91.1FM: Charlottesville Virginia. 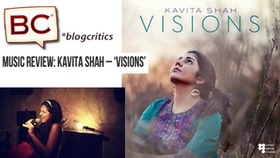 Kavita Shah's liner note describes her ambitious intention in Visions, her album due for a May 27 release, as an attempt "to see what happens when seemingly disparate elements come together, on their own terms, in dialogue." She goes on in a rather mystical vein, "A dialogue outside the restraints of our mortal perceptions of time and space. A dialogue in which those parts of us that are not physically present may come to life in an eternal encounter." The "disparate elements" she is talking about reflect the variety of multi-cultural influences that have shaped her life especially, it would seem, musical influences and traditions. She goes on to name four specific traditions referenced on the album: jazz, Brazilian pop, Mandé music, and Hindustani classical. She disavows any intention to imitate them or force them into some kind amorphous blend. It is cultural dialogue, the juxtaposition of traditions to each other that interests her as a composer and as a singer. READ THE FULL Blogcritics.org REVIEW. 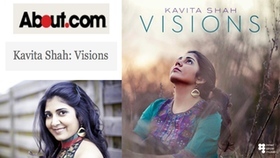 Kavita Shah is set to release her debut recording - Visions and will celebrate with a performance at NYC's Joe's Pub on Tuesday, May 27th. 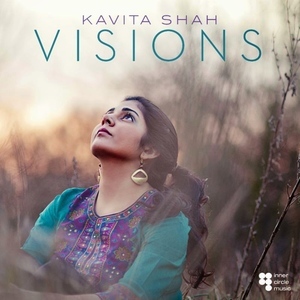 A vivid self-portrait in mosaic form, Kavita Shah's Visions (available May 27th on Greg Osby's Inner Circle Music) heralds the arrival of a strikingly original, globally minded new voice. The gifted vocalist/composer brings together a rich variety of musical, cultural, and personal influences into a formidable debut album that combines a jazz quintet with Indian tablas and the West African kora. Visions interweaves Shah's multicultural background (she's a native New Yorker of Indian descent fluent in Spanish, Portuguese, and French) with her wide-ranging musical tastes (reared on 90s hip-hop, Afro-Cuban music, and bossa nova, she studied jazz voice and classical piano) and her fascination with ethnomusicology (which she studied at Harvard). The album was co-produced by the renowned Benin-born guitarist Lionel Loueke, a kindred spirit who shares the singer's cohesive view of a multi-hued musical experience. 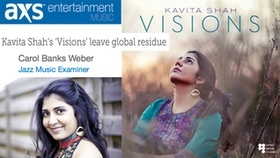 Indian American vocalist-composer Kavita Shah has collaborated with guitarist Lionel Loueke on her debut album - Visions, a reflection of her multicultural background and diverse musical tastes that range from Afro-Cuban music to classical piano. Co-produced by Loueke, the album combines a jazz quintet with Indian tabla and West African kora. It is set to release May 27 via Inner Circle Music. Shah is a native New Yorker of Indian origin, fluent in Spanish, Portuguese and French. READ THE FULL IndiaWest.com ARTICLE. Kavita Shah brings a fresh, cultural perspective to jazz, not only singing and composing, but arranging her music as well. Here is an artist steeped in ethnomusicology. With East Indian roots, she was born and raised in New York City and speaks fluent Spanish, Portuguese and French. Her musical tastes reveal influences of Hip-Hop, Afro-Cuban and Latin music with a love of jazz and composition, intertwined and delicate as a colorful silk scarf. She has co-produced this premiere artistic endeavor with Benin-born guitarist, Lionel Loueke. Loueke brings excellence and sensitivity to the project. Together they express a multi-hued cultural view of music in a unique and surprisingly pleasant way. Her voice is clear and unpretentious; an honest soprano with a somewhat folksy style. You get the feeling that her stories are worthy of the listener's ear. I was captivated by her take on the Joni Mitchell composition "Little Green" and found her interpretation of Stevie Wonders song, "Visions" somewhat contemptuous of the original production, but interesting all the same. Her voice is enchanting over the percussive undertow. After all, I rationalize, jazz is meant to improvise on a theme. She does just that, interjecting harmonic voices, like an ethereal chorale above Steve Newcomb's tasty piano solo. "My experience of diaspora has not exactly been linear, but more like a kaleidoscope. So musically, I wanted to bring together different elements that I love, and combine them in a way that may be surprising to others but makes sense to me." Because of the musicality of her voice, it's easy to compare Shah to an instrument rather than a vocalist. The challenge is 'the mix' and to the artist herself not to forget that the lyrics are as important as the music. On occasion, even with headphones, I sometimes had difficulty understanding the lyrical content of her songs. 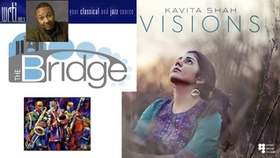 A vivid self-portrait in mosaic form, Kavita Shah's Visions (available May 27 on Greg Osby's Inner Circle Music) heralds the arrival of a strikingly original, globally minded new voice. The gifted vocalist/composer brings together a rich variety of musical, cultural, and personal influences into a formidable debut album that combines a jazz quintet with Indian tablas and the West African kora. Visions interweaves Shah's multicultural background (she's a native New Yorker of Indian descent fluent in Spanish, Portuguese, and French) with her wide-ranging musical tastes (reared on 90s hip-hop, Afro-Cuban music, and bossa nova, she studied jazz voice and classical piano) and her fascination with ethnomusicology (which she studied at Harvard). The album was co-produced by the renowned Benin-born guitarist Lionel Loueke, a kindred spirit who shares the singer's cohesive view of a multi-hued musical experience. WATCH THE BEHIND THE SCENES VIDEO. Chaya Babu discovers the musical influences that shape the unique vision of singer Kavita Shah It was a chilly Thursday afternoon and everyone in New York was coming down with something after the slow months of gray winter. Kavita Shah had to almost cancel our meeting because she woke up with that knowing, groggy feeling of an impending cold - a dreaded moment for all of us who have things to do, but likely worse for a singer. She decided to push through though, and when she finally arrived at Bowery Coffee in a puffy jacket over a sweater, her curly hair in a flowing mass around her rosy-cheeked face, I could hear the congestion. She just needed to be gentle to make sure she doesn't hurt anything, she told me, so we chatted quietly about her up - coming album and her recent show at The Rubin Museum over the coffee shop's poor interpretation of Masala Chai. Visions, her debut album, drops this month. With that right around the corner, being released on a small label called Inner Circle Records, Shah - Downbeat's Best Graduate Jazz Vocalist (2012) and winner of an ASCAP Herb Alpert Young Jazz Composers Award (2013) - is working hard on the various bits leading up to the release. "It's an exciting time because this is my first CD, and I hope it gets out there and leads to more opportunities to share the music with more people," she said. "But it's definitely a little nuts. I'm preparing for a few concerts, and being a band leader means organizing rehearsals, organizing logistics, coordinating with publicist, coordinating printing of album with label, getting copyrights in order, all these little, little pieces." On Visions, her collaborators include Lionel Loueke on guitar and vocals, who co-produced the album and whom Shah credits as having been hugely influential to her career; Steve Wilson, sax and flute; Yacouba Sissoko, kora; Stephen Cellucci, tabla; Rogerio Boccato, percussion; and Linda Oh, bass. Together, the group creates fresh iterations of Joni Mitchell's Little Green, Antônio Carlos Jobim'sTriste, a few of Shah's original pieces, three raags, and more. From the track list alone, it's clear that Shah has had a range of musical influences that have mingled to create her style, one that is soulful and certainly rooted in jazz, a distinctly American art form, but also pulls in threads of what she has learned and listened to throughout her lifelong exposure to cultures from around the globe. She mentions names and genres, some familiar and others utterly obscure, that have inspired and paved the way for her: Sheila Jordan, Meredith Monk and John Tavener, Hunga -rian folk music Stevie Wonder, morna, samba, bossa nova, Samir Chatterjee, hip-hop, Touamani Diabaté and Ali Farka Toure. Yet, despite the varied textures, rhythms, and roots of her musical identity, the overall sound has unity and cohesion. Her fall appearance at Brooklyn's Shapeshifter Lab show -ed her spunky and unrestrained, crooning out her own rendition of upbeat tracks like M.I.A. 's Paper Planes with tablas as well as a more haunting Portuguese tune Sodadeby Cesária Évora. Months later, her performance at The Rubin Museum in Chelsea, a first-time duo with Loueke, was soft and vulnerable, something you felt privileged to witness because Shah was on the shy side, experimenting with and exploring new terrain. Still, both of these evenings brought out what is unfailingly Kavita Shah, her voice like honey over lyrics in different languages. "When I heard her, I was immediately dumbfounded," Greg Osby, who runs Inner Circle Records, told India Abroad. "She sounded very mature - there was a host of characteristics with her delivery that were evocative of another era and another time. Some people call that an ‘old soul,' someone who's lived a long life and experienced a lot. Obviously she has it. And obviously that was very special." Osby met Shah last year at the EPCOR Center for Performing Arts in Calgary, Canada, where she was studying and he was an instructor. When she approached him, he was impressed by her vast knowledge, her maturity, and the curiosity evident from her probing questions. After seeing her play at one of the evening student jam sessions and then hearing that she was in production of her first record that things started to come together. They decided to stay in touch in New York. "That struck my interest, of course, because I seek out people who are eclectic and very individualistic in their approach, their whole concept," he said. "They drew from a broader variety of sources than expected. She embodied all of those traits, and she's a truly global artist. That's primarily the resounding theme of our label. We probably host one of the most international rosters of any that I've seen, and that made her a custom fit for what we are about and what we do." Shah's upbringing in New York City and the life that came from that is what has led her to grow into what Osby describes. At 10 years old, she began singing with the Young People's Chorus of New York City, through which she learned and became obsessed with Ella Fitzgerald's A-Tisket A-Tasket,the start of her love for a mix of jazz traditions. It was rigorous musical training, a program that brought together children from all over the city and diverse racial and socioeconomic backgrounds. Some of the kids had never seen anything close to the interior of a Park Avenue apartment, where donor events would sometimes be held, but they sang at Carnegie Hall. Together the chorus rehearsed three times a week and had 40 to 50 performances a year. Here Shah learned not just jazz, but pop, gospel, classical, folk styles from around the world, and more. She acknowledged that ‘authentic' is a complicated term, but is thankful for the way the YPC forced her to always understand the heart of the types of music they were working with. On her own as a teenager, she sought out Brazilian and Cuban music, trying to get the pronunciations in the lyrics correct, just as she'd learned to do through the choir. It was a passion that stuck. "I think the journey from the re, from my family life and I childhood, in terms of my own life or own influences are just as real too: Growing up among a large Hispanic population in New York and having the Spanish language around me, that's a big part of who I am," she said. "I grew up studying Spanish and lived with a family in Ecuador when I was 16, and suddenly the language became connected to people and experiences, and that's when I got really into it." At Harvard, she majored in Latin American Studies and ended up in Salvador for a study-abroad program. This was pivotal: She described Salvador as a magical city that not only showed her a world where brown was mainstream, but that also showed her music as a way of life. By this point, Shah's family was just her and her mother. Her father passed away when she was at 18, and then all four of her grandparents, who had been around to help raise her, also passed away within three years. She looks back at this time as a moment that severed her cultural connections to India in a way, since the older generations were her direct tie to the subcontinent. But other vibrant places drew her in. "Sometimes it's easier to look through another lens versus looking in the mirror when it comes to thinking about culture, and that's what I think studying other languages did for me," she said. "And they eventually brought me back. There's not straight line; it's more of a kaleidoscope." Her circuitous path has brought her back in a way. 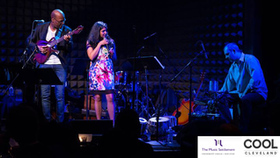 At The Rubin Museum, with Lionel Loueke on the guitar, Shah paid homage to her own ethnic roots and sang a Gujarati folk song for the first time, as well as her original composition,Loej, named after her grandmother's village in India where the men pay the dowry. Along with this, the pair did their original Rainwash; Herby Hancock's Alone with Shah's own lyrics over it; Benny's Tune, in Fon, a Beninese language; and songs from the album, including, Sodade and Oju Oba.And they did a lot of playful freestyling. Shah's tentative yet excited energy shone in the spotlight in a black room where the small audience sat, rapt and silent. "That space is a very intimate setting, and it was just the two of us and a special guest Rogerio Boccato, who's a great percussionist from Brazil, and the idea, well for me anyway, was that it was a chance to be really honest and intimate," Shah said. "In that kind of situation, there's no other way to do it. You're so exposed in a duo setting. There's nowhere to hide. And especially in that big of a room, you have nowhere to go except to just be there and be honest. And that was the beauty of that concert: I knew I could be that person with Lionel, and I wanted it to be that fragile, vulnerable experience." When she speaks of Loueke, her admiration is lucid. His music is hard, really hard, she said; it's rhythmically challenging, in a meter of 15, as opposed to 4-4 or 3-4. Still, despite his being such a complex and accomplished musician and mentor, she feels like she can be entirely herself with him. He is a safe place for her. Part of that is his own international understanding of music because of his background. Loueke, now a New Yorker, is from West Africa and has lived in France, so he incorporates extensive and assorted traditions and instrumentation into his work, just like Shah - or perhaps it's the other way around considering Loueke's expertise. "I felt that if there's one person out there who does what I'd like to be doing, it's him in terms of having a formation in jazz that informs his approach but having a real openness and kind of ear to the ground," she said. "When we talked about the album, I didn't even have to explain to him what I'm trying to do; he just understood right away. So that was a very exciting collaboration. "One thing I think about a lot is that part of being this modern global citizen is having disjointed parts, memories in different places, connections to people and cultures that are all separate. When you're one person at the nexus of all of that, it's beautiful because it enriches your life, but it's also very lonely because there are very few people you can share that singular perspective with. So that's something I felt I can share with Lionel. He understood from the beginning who I was and how I was trying to put that into music." Shah's vision comes through on Visions, the track list including Moray, Deluge, and a raag Desh Meltdown, on top of what she performed at The Rubin Museum and Shapeshifter. In the next weeks she and the whole band will be continuing to bring this to audiences through their first wave of shows leading up to the album drop and after the May 27 release, a few gigs on the West Coast this summer. Osby said he looked positively to the album's reception due to Shah's novel style: "She comes up with a sound that's far more personal and far more detailed than people who have been out many years before her. That's a huge selling point: here's somebody who's taken all of these resources and beautifully and respectfully corralled them into something that sounds truly original. People use that word recklessly - unique and new and all that -but her sound is truly that." 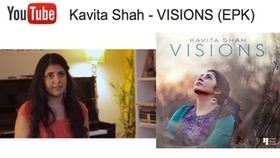 Hailed by Downbeat Magazine as the "Best Graduate Jazz Vocalist" (2012) and winner of the ASCAP Herb Alpert Young Jazz Composers Award (2013), Kavita Shah is gaining a reputation as a visionary young singer, composer, and arranger. 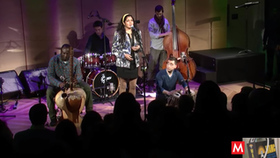 A native New Yorker of Indian origin fluent in Spanish, Portuguese, and French, Ms. Shah incorporates elements of Indian, Brazilian, and Malian music into her jazz-based repertoire and we are thrilled to have her join us as we continue the cross cultural jazz discussion for International Jazz Month. Her debut CD "Visions"–produced by Benin-born jazz guitarist Lionel Loueke–combines the sounds of the traditional Indian tablas and West African kora with those of a jazz quintet. "Visions," which includes special guests Loueke (guitar, vocals), Steve Wilson (saxophone, flute), Yacouba Sissoko (kora) and Rogerio Boccato (percussion), will be released this May. 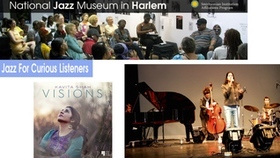 Ms Shah will be featured at the National Jazz Museum in Harlem TODAY!! Tuesday April 8, 2014@7:00 pm for the museum's 'Jazz For Curious Listeners' an International Jazz Discussion and Live Music Series. JAZZ FOR CURIOUS LISTENERS is a Tuesday evening program that takes an in-depth look at jazz. Interaction is welcomed as jazz is explored from multiple perspectives, some traditional and some quite surprising. This series features popular formats such as "How to Listen to Jazz," breaking out singular elements of the music; "Classic Recordings" and "Centennials," devoted to exploration of a particular album or artist; "Jazz on Film" screenings of classic performance footage (in collaboration with the Maysles Film Center); and "Young Musicians You Should Know," which introduces new talents.